This week's Sunday Night Suds looks at New Belgium's 2018 Tartastic - the Strawberry Lemon Ale. 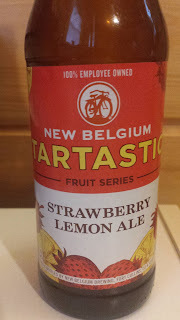 Much like the Citradelic and Voodoo Ranger lines, New Belgium is continuing to pump out new fruit flavored tart beers as part of the Tartastic Fruit Series (for a review of last year's Tartastic Lemon Ginger Ale, click here https://kosherbeers.blogspot.com/2017/04/sunday-night-suds-new-belgium-tartastic.html). After seeing this in Oliver's in Albany earlier in the week, I knew that I had the 9 days havdallah beer for someone who was not into strong beer flavor. This beer has a base of a Berliner Weiss which is a tart ale usually low in alcohol. And given that this beer is 4.2% abv, it certainly is low on that spectrum. There was an artificial strawberry flavor which was not overpowering, but not very pleasant either. I would not buy this again and was glad that I had only bought a single, but the fellow who made havdallah on it at Camp M seemed to like it, so mission accomplished. The New Belgium Tartastic Strawberry Lemon Ale is under kosher supervision by the Scroll-K/Va'ad of Denver, and their symbol is on the bottom of the six pack holder. However, not every brew produced by New Belgium is under kosher supervision. To see what the experts on Beer Advocate think about The Tartastic Strawberry Lemon Ale, click here https://www.beeradvocate.com/beer/profile/192/315829.